These Elf-Approved Holiday Sugar Cookies are made with Hiland Dairy Sour Cream, making them exceptionally rich and flavorful (and the kids will have a blast decorating them, too!). In a large bowl, whisk together flour, baking soda and salt; set aside. In second large bowl, cream together the sour cream and butter with an electric mixer at low speed. Add sugar, eggs and vanilla; mix until combined, or until no butter chunks are visible. Gradually add the flour mixture to the sour cream mixture, mixing well until combined. Dough will be sticky. Divide dough onto three pieces of plastic wrap; flatten dough, wrap tightly and refrigerate for 1-2 hours. Preheat oven to 350°F. Line two baking sheets with parchment paper; set aside. Generously flour counter or work surface. Spray rolling pin with cooking spray; rub flour onto the rolling pin. Put one of the chilled pieces of dough on top of the floured surface and sprinkle the top of the dough with more flour. Roll the dough evenly until 1/4 inch thick. Cut out shapes and place them on the baking sheets. Continue process with remaining pieces of chilled dough. Bake for 8-10 minutes. Transfer cookies to a cooling rack. Once cooled, frost and decorate. Enter your best cookie recipe in our cookie contest! Do you think you have the best holiday cookie recipe? 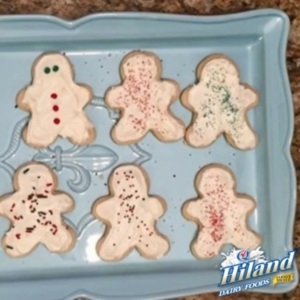 Then be sure to enter this year’s Hiland Holiday Home Cookie Contest by December 31, 2015 for a chance to win the prize package valued at $1,000! Your entry may even be featured right here on The Hiland Home!